After Michelle Gerson-Wagner got engaged, she turned to Pinterest in search of wedding inspiration. 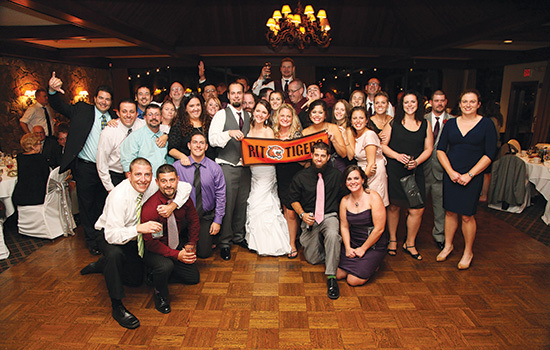 One pin in particular would spark what is now a growing tradition among RIT/NTID alumni weddings—Tigerhood of the Traveling Banner. The post was a picture of a bride and groom, surrounded by all of their college friends, holding a banner printed with their alma mater’s name. But she didn’t wait for her own special day to get the banner traveling. As a staff member in the NTID Office of Admissions and a member of the NTID Alumni Association Board of Directors, she shared the idea with quite a few others, who then asked to borrow the banner for their own weddings. When word of the idea continued to spread, Gerson-Wagner decided to create a Facebook group to get more alumni involved. The group, which now has more than 270 members, also serves as a place for participants to share their final photo. 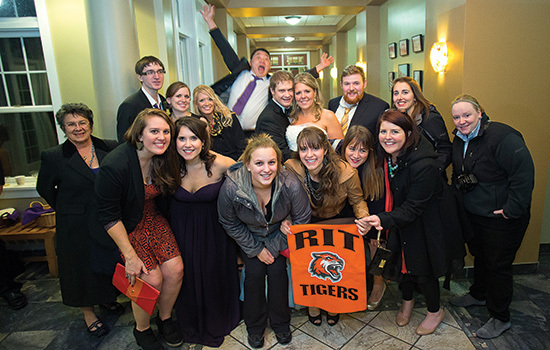 After the first wedding on May 6, 2013, the banner made its way to eight more RIT/NTID weddings that year. For 2014, Gerson-Wagner expected more than 15 weddings. Due to this increase in popularity, she now has three banners, all purchased from the RIT bookstore, to avoid any scheduling conflicts. For Kiersten Shinrock Blankley ’09, ’09 (psychology, sign language interpreting) and Albert Blankley ’09, ’13 (biology, public policy), more than a quarter of their wedding guests were RIT alumni. 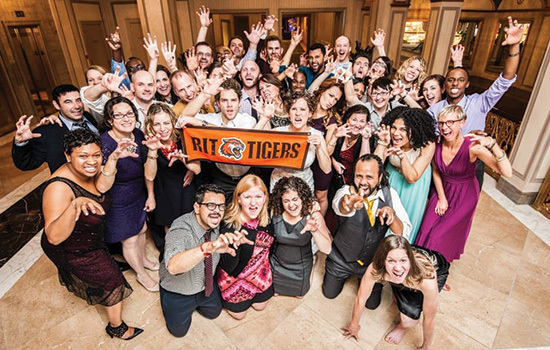 Having met when living on the same residence hall floor in 2005, including the banner at their wedding allowed them to celebrate their time at RIT and the people who made it so special. 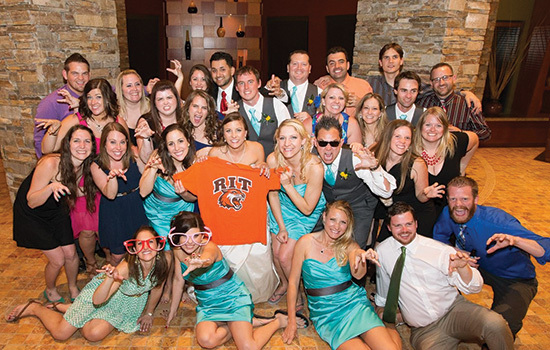 For Kelly Metz Davis ’05, ’08, ’13 (business, accounting, professional studies) and her husband, Mark Davis ’04 (computer integrated machining technology), having the traveling banner at their wedding was a way to show their piece of RIT/NTID history. The couple met through a mutual friend during their freshman year after he caught her eye at a flag football game on campus. They were married on Oct. 19, 2013, in West Seneca, N.Y.
“It enhanced our wedding experience because we realized that without RIT/NTID, we wouldn’t have the wonderful friends in our lives as we do now,” said Metz Davis. As for Gerson-Wagner, her wedding on Sept. 15, 2013, was the sixth alumni wedding to be part of the new tradition. She met her husband, Jason Wagner, online and the two were married in Rochester with more than 20 alumni in attendance. Michelle Gerson-Wagner ’08, ’14 sends the banner to the provided address free of charge. 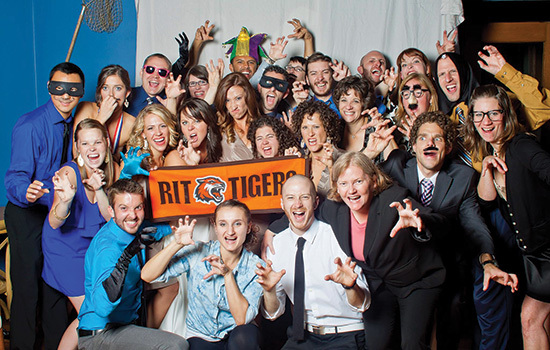 A professional picture of all RIT guests with the bride, groom or both (if both are alumni) holding the banner must be taken. The name of the couple, their RIT class years and wedding date is signed on the back of the banner. After the wedding, the banner is sent back to Gerson-Wagner to pass on to the next couple. A copy of the high-resolution image is sent to Gerson-Wagner once obtained by the couple and is posted to the Facebook page. For more information on how Tigerhood of the Traveling Banner works or to reserve the banner for your wedding, visit the Facebook page at http://on.fb.me/1qPVpxV. Rochester, N.Y.: Kiersten Shinrock Blankley, ’09, ’09 (psychology, sign language interpreting) and Albert Blankley ’09, ’13 (biology, public policy) were married Nov. 9, 2013. Thirty alumni attended. West Seneca, N.Y.: Kelly Metz Davis ’05, ’08, ’13 (business, accounting, professional studies) and Mark Davis ’04 (computer integrated machining technology) were married Oct. 19, 2013. Thirty-three alumni attended. Cleveland, Ohio: Lauren Bain Millikin ’06 (social work) and Dan Millikin ’01 (psychology) were married Nov. 2, 2013. About 40 alumni attended. Rochester, N.Y.: Michelle Gerson-Wagner ’08, ’14 (communications, service leadership) and Jason Wagner were married Sept. 15, 2013. About 25 alumni attended.